When it comes to buying flowers, you can order online at a reseller, go to a supermarket, or order from a local florist. We understand that you have choices, and that sometimes one is a better choice than another. At an online reseller, your flowers choices are limited to what’s on the screen. Look at the photos and you will see that each floral design can be broken down into a very specific recipe to allow it to be cheaply and easily re-created. If the vendor belongs to a wire service, each layer of service provider (POS, florist, delivery, etc) takes a percentage of your money. The hard-earned, post-income, pre-sales tax $100 that you spent has dissolved into $75 worth of flowers. And after commercial shipping, they look rather worse for wear. At a supermarket, your money buys a lot of cut stems. These flowers are standard varieties and grown in the cheapest conditions. The design and care given to these flowers are minimal, and that’s all we really need to say. Some local florists belong to wire services, and for this they pay fees every month. As above, your flowers are compromised by the percentage slices claimed by this marketing chain. Upper Village Blooms takes orders only from our customers. Therefore, we do not pay wire services to bring in volume business. We drive ourselves to the flower wholesale markets twice weekly to hand-select the freshest flowers available. The flowers we choose are above-market and are not available to supermarkets and wire services. When we return to the shop, we typically spend 3-6 hours cleaning, trimming and preparing them. 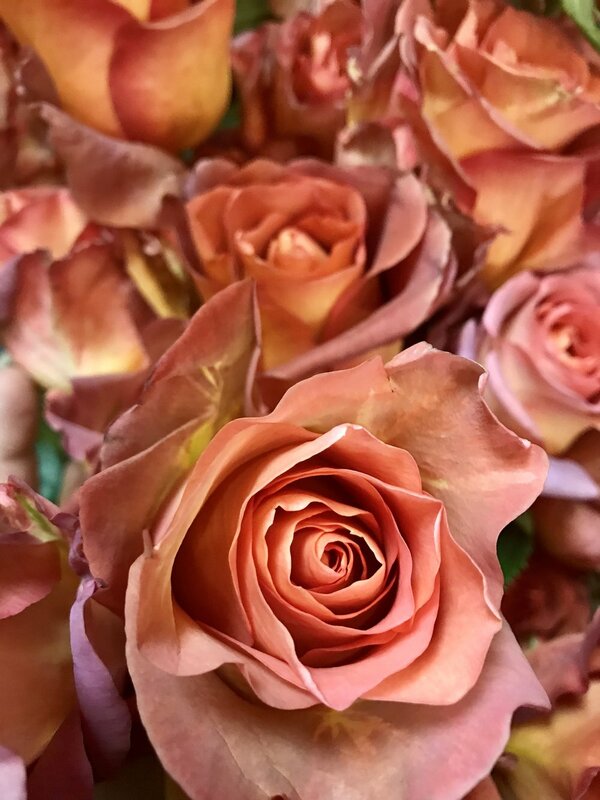 We give them another quality check, and only then do they go into custom arrangements or are available for you to choose as a single bloom. When we sell you flowers, we expect to see you again. Either because we’re neighbors or our kids are in the same school, or perhaps because our flowers are extraordinary. We care for them tremendously, it is what we do. We also sneak more flowers into our arrangements and bouquets because it is another way to show how much we love our flowers! We are a small retail shop in an amazing Rivertown with foot traffic, wheelchair accessibility and parking. When we say we are proud to be a part of our community, we mean it —we do not charge a standard delivery fee within 10520. Come visit us and see how the Upper Village is Blooming! Chamomile is not going to make our cut. We take photos of every less than perfect bloom and report back to our flower vendors. We love having a flower fridge stuffed with fresh blooms! This is one of our favorites and it is not available often. Ranunculus, otherwise known as a ‘buttercup’ is one of the most gorgeously complex genus of flowers. This freesia not going to advance to the flower fridge.